Find this weekend's featured set in your Game Menu tomorrow! Deep within the caves under Brightoak Grove lives a humanoid, semi-sentient creature that only comes to the surface during one of the Brightoak Druids quarterly Lunar renewal ceremonies - The Underglade Scavenger. During the latest rite, the poor beast fled in fear, sensing a disturbance in Lore's ley lines. Sadly, it ran into a pool of Extriki's toxin, and was irreparably tainted. 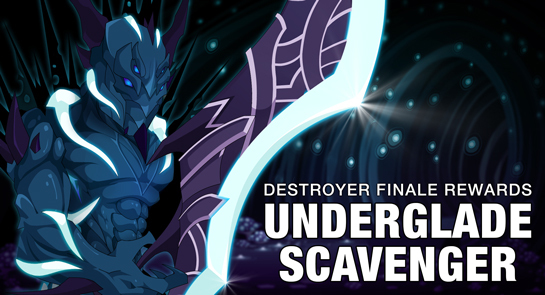 Starting this Friday, find the Underglade Scavenger in the Rift Gear shop for AdventureCoins or gold (for members). All heroes can battle Extriki the Destroyer to unlock the Toxic Scavenger set!